Bless him, he had tried. 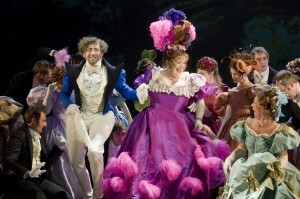 But it was the involuntary groan of “Oh God” when the audience gave Les Mis a standing ovation that gave him away. Mr S was not a happy theatre critic bunny. There were some great voices in the cast: John Owen Jones as Jean Valjean and Katie Hall as Cosette, dampened only by the truly awful Madalena Alberto as Fatine and the irritating little kid. Not his fault though, the part itself is a shameful technique to make the audience coo and giggle and ultimately, and inevitably, shed a tear when he buys it. This is not a show for theatre critics. But is a show for fans. I loved it. Admittedly, I do have the double CD soundtrack on my iPod. Was it a stagetext performance? I just thought they’d caved in and turned it into the latest brand extension – Les Mis The Karaoke experience! Like you I thought Madalena Alberto was awful – it’s not often you find me wishing to bring on SuBo and Rosalind James seemed to be in a competition to see how quick she could sing On My Own. Apart from that (and the low flying plates into the pit) a very good show – even if you couldnt see the projections from the cheap seats in the gods!